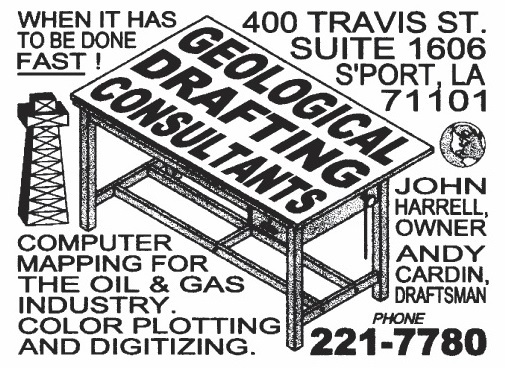 Welcome to the Shreveport Geological Society website. Here you'll find information about the SGS, our sponsors, publications, monthly meetings, past lectures, seminars, upcoming events and pictures, scholarships, maps in schools program, the mock dig, jobs board, our monthly newsletter, announcements, useful links, how you can become a member, and much more. If you intend to be a licensed geoscientist in Louisiana, read this information and visit the Louisiana Board of Professional Geoscientists' website. Got a question or comment? Contact the webmaster. Thank you, Faithful Friends and Newsletter Sponsors. The Shreveport Geological Society publishes reference reports on oil and gas fields and the regional geology of Louisiana, Arkansas, Texas, Mississippi and Alabama. Acclaimed guest lecturers present at SGS meetings on a monthly basis. Members can also join in the annual ALTAPL-SGS Golf Tournament at East Ridge Country Club, the Geology and Wine Dinner at the Petroleum Club of Shreveport, and the Hit & Run at Pierremont Oaks. Each year the Shreveport Geological Society organizes a Mock Geological Dig, presents geologic maps to schools, and gives scholarships for undergraduate and graduate study in geology-related programs.